You know when your house needs cleaning. Your spouse or partner, kids, friends, or worst, mother-in-law, may have a different opinion, but you know how much dirt and disorganization your home can handle. One day, you'll walk into a room, and say "Yep, it's time to clean." Maybe once a day, a few times a week, or twice a month, but it'll happen. Then, a question remains: Where to start? We're here to help. Every Wednesday in March, Curbly's Spring Cleaning and Home Organization month, we're offering free, downloadable cheat sheets and check lists to make your spring cleaning a breeze. Each is neat and well-designed, including essentials and ignoring little stuff that just doesn't apply. Starting things off, let's begin in the center of the home: the kitchen. i would like to download the cheat sheets but don't see a link to do that. where can i download this at? okay...I signed up for the newsletter...now how do I get that nifty no brainer cleaning sheet?! Love this! Just added you on facebook so I could download. Thanks! 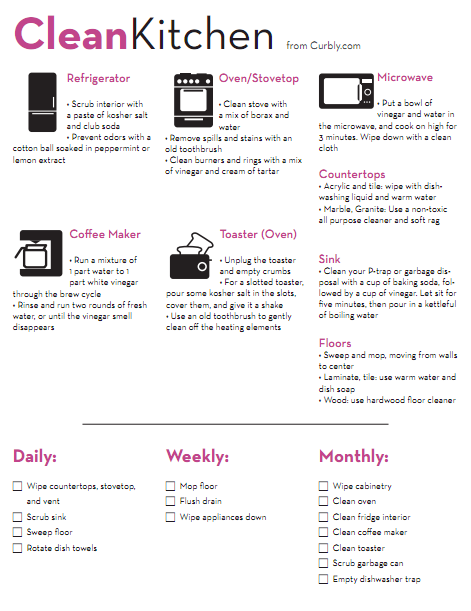 Free House Cleaning Cheat Sheet (and Check List)!